The Libec RSP-850PD(B) Professional Pedestal System consists of the RHP85 Fluid Head, PH-8B Pan Handle, and an Outside Broadcast Dolly DL-8B. This compact Pedestal System is designed to accommodate studio cameras weighing up to 55 lb (25kg). It is equipped with the double bearing system to prevent wobbling and ensure smooth movements. Easy to set up, this pedestal system is supplied with air pump for weight adjustments. The Libec RHP85 Fluid Head with PH-8B Extendable Pan Handles features the fully adjustable Continuous Counterbalance technology. It offers optimal counterbalance, as well as Balance Stabilizer Mechanism that prevents the slightest wobble on your image, while providing a smooth balancing system. The Fluid Head features a 7-step pan and tilt torque switch that covers a wide torque range. The one-touch attachment and release ensures that the camera plate can be attached and detached with just a touch, enabling fast and easy setup. The Fluid Head comes with the PH-8B Pan Handle with rubber grip that can stop the camera precisely at any tilt angle. The Fluid Head is capable of operating at temperature of -40°F. The Fluid Head features a 100mm diameter ball head. It is designed for use with ENG (Electronic News Gathering) cameras that can capture fast moving objects. It is capable of handling a payload of 55 lb. This Libec Pan Bar Handle is compatible with the Libec RHP75, RHP85, and LX10 video heads. It connects and locks into either side of those heads with a clamp and bolt for right or left-handed use. A rubberized handle provides a comfortable means to move its telescoping aluminum-alloy shaft, which is effectively adjustable from 16 to 22". This angled pan bar handle can rotate within its clamp, allowing a downward-pointing orientation for right or left-handed use. It is packaged for immediate installation with a downward-pointing orientation for right-handed use. For a pan bar handle that installs on a Libec RHP75, RHP85, or LX10 video head and is packaged for immediate installation with a downward-pointing orientation for left-handed use, the Libec PH-8BL Extendable Pan Bar Handle can be used instead. 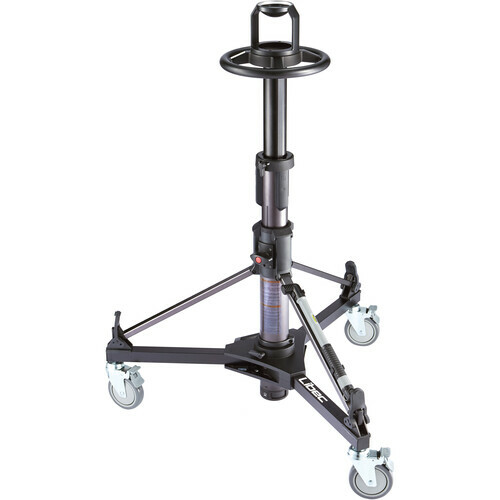 The DL-8B Heavy Duty Dolly from Libec is designed for use with the T102B and T102B Tripods. It is equipped with casters and brake locking system. Box Dimensions (LxWxH) 14.8 x 10.4 x 7.9"
Box Dimensions (LxWxH) 17.75 x 3.9 x 3.05"
Box Dimensions (LxWxH) 31.0 x 13.2 x 11.0"
what is the maximum and minimum height?